Be the first to share your favorite memory, photo or story of Opalene. This memorial page is dedicated for family, friends and future generations to celebrate the life of their loved one. 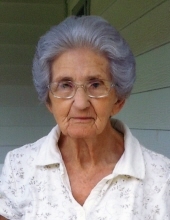 Opalene Litral, 83, of Anderson, died Thursday, March 28th, 2019. Opalene was a graduate of Lexington High School. She worked as a nurse at D.E. Jackson Memorial Hospital and retired from ECM Hospital after 20 years. She loved The Lord and her church family at Crossroads Primitive Baptist Church. She also loved gardening, flowers, cooking, watching TV and visiting her sick friends. Visitation for Mrs. Litral will be held at Rogersville Funeral Home, Monday, April 1st from 11a.m. – 1p.m. with the funeral service immediately following. Burial will be in Hammond Cemetery. Opalene is preceded in death by her parents, Marvin and Emma Craig; husband, James “Bill” Litral; sisters, Eleanor Thigpen; and grandson, Aubrey Austin. She is survived by her children, Dianne (Ricky) Austin, Tim (Gale) Litral; grandchildren, Luke (Haley) Austin, Tabrina (Andy) Gibson, Joshua (Whitley) Litral and Corbin Jackson; great-grandchilden, Destiny, Lily, Isaiah, Jacob, Austin, Maci, Ryker, Macon, Anna and Baylee. The family would like to thank Compassus Hospice Care for their compassion they showed. Visit rogersvillefh.com to share memories with the Litral family. To plant a tree in memory of Opalene Litral, please visit our Tribute Store. "Email Address" would like to share the life celebration of Opalene Litral. Click on the "link" to go to share a favorite memory or leave a condolence message for the family.